According to the late John Britt, States was the final pattern in a series that was named for each of the states–only a few of which can be found in Carnival. 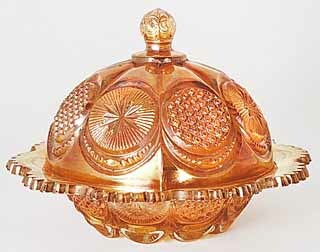 One butter dish sold for $375 in 1998; another for $220 in 2005; and a third for $160 in 2012. The 8-inch oblong bowl sold for $25 in 1999; two more brought $25 and $40 in 2005. 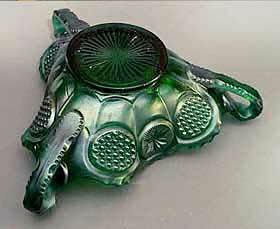 This three-handled bonbon in green sold for $1,047 on eBay in 2006.